Pallets and palletised items make up some of the biggest portion of transported freight across Australia. As a result, single pallets, empty pallets and shrink wrapped pallets are shipped throughout the country, both locally and interstate, every single day. When it comes to shipping, storing or relocating goods, pallets are an essential part of the process and so finding transporters to move pallets when needed is crucial. For that reason, finding a transport company who have the right vehicle and equipment to carry your palletised freight is important. Get quotes for palltetised freight today! Get 3 Quotes for transporting pallets. It’s free to request quotes. Single Pallet: If you have a single pallet or a number of pallets, then you need to specify this to ensure the right truckies are quoting you on your individual palletised freight and requirements. The number of pallets plays a vital role in which truck or trailer can be used. You will see below in the list of what trucks are used a thorough breakdown of what each truck can carry and how that is distinguished. It can also be advantageous to use specialised crane truck pallets if crane loading is required. These specially designed pallets have metal strips that offer protection from breakages when lifted. 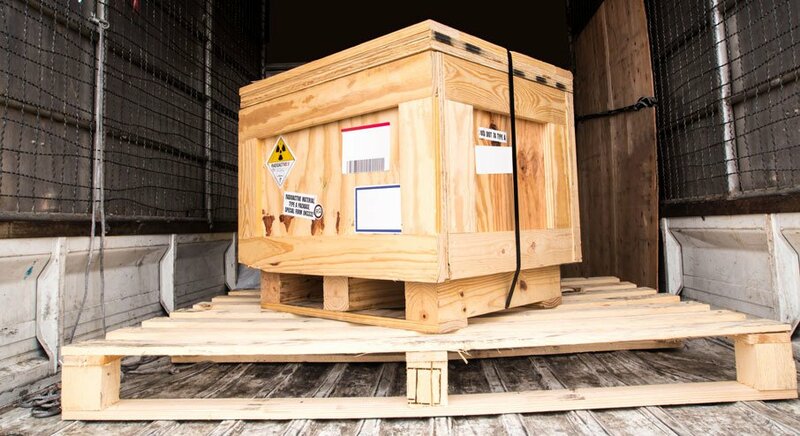 Shrink Wrapped Pallets: Packing your goods or materials onto pallets makes the loading and transporting of your freight manageable and takes out massive challenges. In many circumstances, the load should then be shrink wrapped so that it stays securely in place. It also allows for pallet loads to be stacked in the truck or trailer and allows transport companies to calculate what sized truck is required. Bulk materials packed on pallets can rarely be lifted into a truck or trailer manually, so assistance is required to load the shrink wrapped pallets safely. This is usually done with a forklift, as the pallet is designed exactly to allow for it to be picked up by the fork. Steel Pallet Cages: The pallet cages are a convenient way to ship goods in bulk and protect the goods from damage or from falling without the need to shrink wrap the goods onto the pallets. To safely load the pallet cages onto the truck or trailer, you will need to use a forklift and often this will be a large forklift to counter the weight depending on the freight. If you don’t have means to load the pallet cage cargo onto the truck or trailer for shipping, then the transporter who shifts your load could do so with a hydraulic tail lift fitted to the back of the truck or trailer. Oversize Pallets: The weight and height of the palletised freight, as well as whether the pallet is stacked as oversized also plays a major part in which truckie can perform the job. Oversized pallets can be double pallets that are the same width as a standard pallet but are double the length. They can also be a standard pallet that is loaded over the regular height. This creates a challenge as it can’t usually be stacked on top of other pallets and the weight and dimensions also change the way oversized pallets are loaded and unloaded. Empty Pallets: Everything from food and beverages to building and construction materials is stacked and transported as palletised freight. As pallets play a vital role in the goods shipped throughout Australia, there becomes a vast and growing need for bulk empty pallet removal and shipment. Empty pallets are relocated across Australia every single day and this includes the returning of pallets to wholesalers and suppliers. If you need this service there are a large amount of transport companies available to assist with bulk loads of pallets. Rigid Trucks: These trucks are most commonly used for transporting pallets and are categorised by the number of pallets they can carry. This is broken down to 6, 8, 10, 12 or 14 pallet sized trucks. The curtainsider/tautliner helps to protect the freight from the weather. Flat Deck Trucks: The pallet capacity for a flat deck is calculated the same way as rigid trucks. They come in 6, 8, 10, 12 and 14 pallet sizes. As there is no curtainsider, this option is only appropriate for materials that can withstand all weather conditions or are sufficiently shrink wrapped for protection. Semi-Trailers: A semi can take up to a maximum capacity of 22 pallets. This should only be requested if the load exceeds the 14 pallets maximum of a rigid or flat deck. With a curtainsider, the semi can also allow for larger loads to be protected from the rain. Crane Trucks: Heavy materials, such as construction and building materials, often result in the need for a crane truck. The standard size is 10 pallets, though you can get a semi-trailer crane truck where the capacity is the same as a standard semi. To prevent damage to the pallets during lifting, a crane truck pallets can be utilised in this instance. Tray Trucks: A tray truck comes in two main sizes. There are trays with a single pallet maximum or there is a larger version which can take a single double pallet or 2 standard pallets. It’s the best option for low volume pallet courier services. A Ute or van could also be used for single pallets. B-Double: These come in two primary sizes, that being a maximum of 32 pallets or a capacity to carry a total of 36 pallets. A curtainsider B-Double assists with materials that need to be protected from the elements. For large loads that exceed the 22 pallet capacity of a semi-trailer, this would be the logical option. Larger Loads: If you have a load of pallets that exceeds the B-Double sized capacity of thirty-six, you can still find a transporter to carry a load as large as this. Multiple trucks can be utilised to fill an order above single trailer capacity and the truckies can determine what’s the best combination of trailers to balance your load. At FreightQuotes, we send your quote request to all our transporters who have advised us that your type and quantity of palletised freight is suitable for them to carry. Whether that is interstate or locally through metropolitan areas, the quantity of pallets is a huge predeterminate as to which truckie or transport company can provide you with your required services. Whether you’ve got a single pallet or multiple truck loads, FreightQuotes can help you find truckies with the right truck or trailer for your individual requirements. Once you’ve lodged your free quote request the specifics of the shipment are sent to all transporters able to carry that sized load within your required locations. From there, up to three of our truckies contact you directly with a quote. Simple, easy and convenient. Pallet transport is available Australia wide. This includes interstate, regional and metropolitan palletised freight covering all states and capital cities including Adelaide, Brisbane, Perth, Darwin, Melbourne, Canberra, Hobart and Sydney. Have general freight or courier items you need to list? You can fill out a Get Quotes form for these items too.